is made of lemon candy! Small and delicate, Larue stands only 13hh tall on a slender and effeminate frame. Her pale yellow body is made entirely of lemon candy, packing a sweet start but a very tart finish— especially on her small, dark yellow birdcatcher spots. 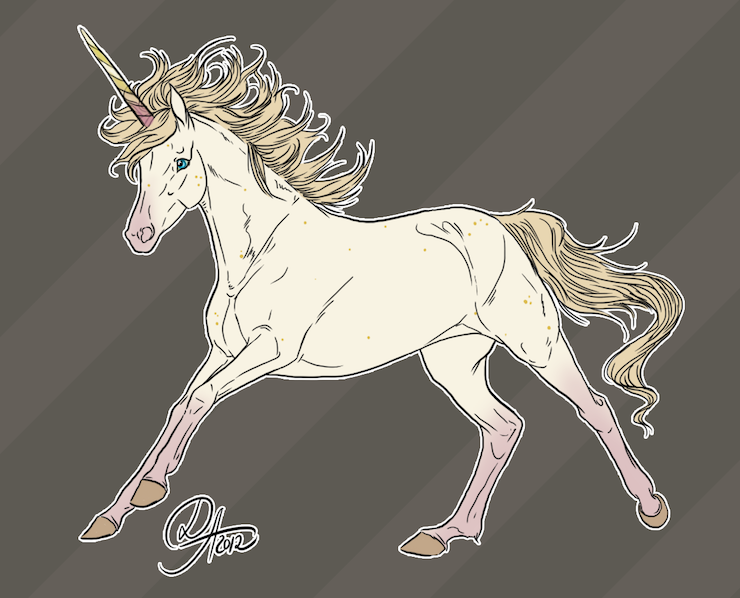 Her mane and take are a dark flaxen, also spun of citrus sugar, although it tends to be slightly sweeter than her skin. Pale, grapefruit stockings coat her slim legs, and her muzzle is the same shade of pink. Bright, aquamarine eyes are forever dancing with mischief. A horn glimmers at her brow, with a grapefruit base spiraling into a translucent sugar and yellow lemon length. Hooves are a dark, pastel rose, with a decidedly sharp, tart bite to them. Born with a poor sense of taste and smell which fades over time, she is unable to taste her own tartness-- but that doesn't stop her from enjoying seeing others taste it. Though she might be small, her personality is larger than most. Quick to talk and sharp to share her opinion, Larue is not easily missed. Despite her parents being all parts sugar and sweet, not many of those traits were passed onto Larue; instead, their tender and loving upbringing of the filly spoiled the already sour lemon. However, she learned the sweet faces of her parents well, and thus hides her devious mischief beneath a saccharine smile— that is quick to turn to a sour snicker the moment another has succumbed to her devious tricks. However, this lemon drop could not entirely evade genetics, and so some parts of her are as sweet as the sugar she's spun from. What are Little Fillies made of? Sugar and spice—not everything nice. Add bitter & sour, still bright as a flower. A smile and snicker, she’ll dare you to lick her. So pucker your kisser, I don’t think you'll miss her. Your tears are due to the lemon Larue. A spoiled upbringing with plenty of tart tricks. Born in Birdsong, to a pair of loving parents Aisling and Johnny, safe in their warm cave in the midst of a thunderous storm, the Lemon Drop was instantly enveloped in adoration. Though, her impish nature soon bored her of the safe embrace of her parents and drove her outside of the Basin and into the Deep Forest, where she came across Cortana drinking blood of a deer. Eyes now wide open to the dangerous aspects of life, the filly found a thrill in flirting with the edge of danger; or, at least, seeing it in others. Her youthful mind then took her further west, to the heart caves, where she builds a rock monster and scares the young Astarot. Her tricks do not end there, as she then digs a trap deep within the forests, and catches the unsuspecting Banjo. Though she likes the strange horsaroo, as he helps her with her prank, catching Ru'in shortly after. Returning to the Basin, she finds herself in Basin day camp, forming a crush on Rein and meeting the strange Ru'in, among other adults. Tallsun brings a father-daughter bonding day, and despite the filly's despair at having to spend time with dear old dad, she actually enjoys time spent with her pops. Shortly thereafter is her first herd meeting, where she spends more time cooking up pranks than actually paying attention. However, her plotting pays off when she wanders into the Green Labyrinth and creates a net to ensnare some unsuspecting cerndyr. Returning home, the filly is gently chastised by her exasperated mother. Orangemoon finds the filly wandering about, stumbling upon a some magical trees protecting an egg, though it does not hold her attention for long. She returns to the Basin, joining (or hijacking) the Orangemoon Festival's foal games. She then returns to her family's cave, finding her mother's companion hatching and gets (accidentally) kicked by Albrecht. Ever curious, the filly wanders south with the cooler weather, finding something new arriving in the Riptide Isles. She develops a crush on the cute, horned and winged Arakh. She then attends a magical drop and is so awed by Shida's foul language and carefree attitude that she tries to bring her back to the Basin with her. Joining a crowd around a strange demon, the filly is cursed with acute a sharp hearing briefly. She then returns to the ocean to watch Kis and Moony talk. Coming back to the Basin, she excitedly realizes that her dad has woken up from his hibernation! Frostfall and the new year bring her attending a herd meeting. The lemony filly also helps decoratethe Giving Tree with bits of her lemony skin, and receives a present from the Turtle. Then, quite bored of the chilly weather, she traps Albrecht with one of her tricks; however, the grouchy old stallion gives her a scare with his anger. All is not fun and games in her life, as she comes across her first loss with Deimos' death. Shortly after, she listens to Kismoa's call for help, and (sort of) assists with cleaning up the beach. Though she is surprised when Kaos reveals himself, she isn't too troubled by it--as she's at trickster herself. Birdsong brings the filly to a herd meeting, where her mother is appointed Lady along with Tiamat, which Rue is quite excited about! The rest of the season passes without note. Tallsun brings the filly venturing outside of her home in Helovia, seeking adventure and mischief abroad. Email: Send Larue an email.